Thomas M. Likens (born about 1800 in Tennessee) and his wife Hester F. Likens was born 1795 in Maryland. The Likens family moved to Henderson, Rusk County, Texas, sometime during the 1840s. He was first enlisted in the military in Crockett, Texas 12 July 1846. 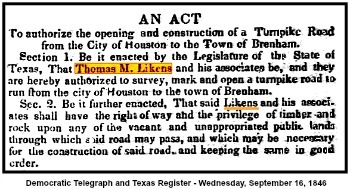 In May 1849 the Texas Legislature authorized Thomas M. Likens and associates to survey, mark and open a turnpike road to run from the city of Houston to the town of Brenham which was about 77 miles. When completed the toll for travel on the road was 10 cents for horse and rider and up to 25 cents a wheel for cart or wagon. The toll was charged for a term of 25 years. Thomas had been a first lieutenant in the Mexican-American war under Gen. Zachary Taylor's command. 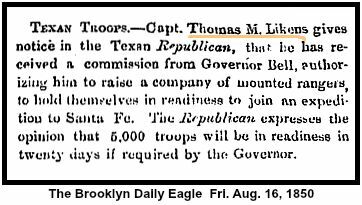 Later Thomas was the Quartermaster at the military garrison in Laredo, Texas. In 1850 Col. 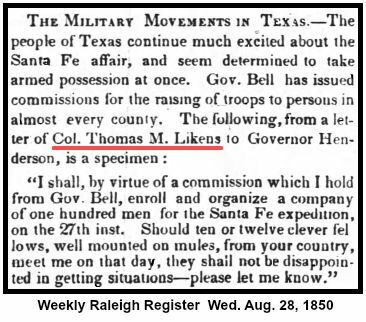 Likens was commissioned to head up a company of one hundred men in an expedition to Santa Fe. Thomas M. Likens was listed as a Lawyer for Rusk County, Texas in 1852 in Livingston's Law Registry. 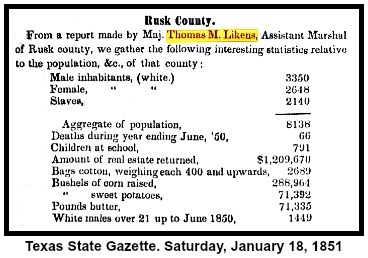 In 1850 Likens had been an Assistant Marshall responsible enumerating the Rusk County population for the US Census. 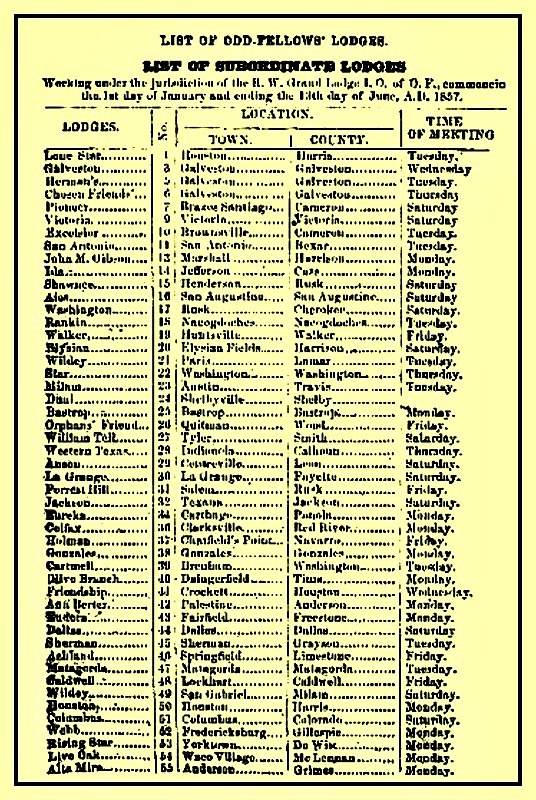 The number of population inquiries grew in the 1850 census. Every free person's name was to be listed, not just the head of the household. The marshals also collected additional "social statistics," including information on taxes, schools, crime, wages, value of the estate, etc. and data on mortality. In 1853 Thomas M. Likens was still an attorney, but no longer practicing, and he had given up his position in the firm of Likens and Estill to his son James, in order to become a farmer and merchant. In 1860 Thomas M. Likens was living at census residence No. 1 with his wife Hester. His financial status was greatly improved during that decade, from $1,000 in 1850 to $2,500 in real estate and $5,165 in personal property in 1860. He also classified himself as a farmer in the 1860 census, and owned probably a section or more of land in that year. He also owned 2 slaves in 1850 and 5 slaves in 1860. Five acres of land were sold by Thomas M. Likens to the Town Commissioners' of Henderson for the purpose of establishing a public cemetery. This transaction was recorded in the first Commissioners Minute Book, and dated December 14, 1855. The selling price was fifty dollars. There was a terrible Henderson business district fire of Aug. 5, 1860. Thomas M. Likens’ store suffered $12,000 damage to the building, fixtures, and stock of merchandise. ​We have received the proceedings of the Grand Lodge and Grand Encampment of Texas at the annual session of those bodies held at Galveston February 1857. The Grand Secretary reports 66 Lodges in this jurisdiction with 1,495 contributing members Value of property owned by Subordinates $10,05.98. The Order enjoys great prosperity in this State and from the proceedings of the Grand Bodies we infer that much interest is felt in the work. The Grand Lodge has purchased a site for a Grand Lodge Hall in the city of Galveston the corner stone of which will be laid with appropriate ceremonies at the next annual meeting of that body.